Through student-to-teacher, student-to-student, and student-to-parent interactions, you can expand the 1:1 model to enhance the learning benefits of digital devices. Often with technology tools, we focus on each student having his or her own device (1:1). Yet, two minds are better than one when it comes to knowledge construction, as social interactions play a vital role in learning. When students share -- or co-use -- a technology tool with someone else, there are pronounced benefits to the learning experience. Co-use is a fundamental strategy for effectively using technology -- a strategy that we tend to ignore in schools. Why is this a more effective method? Imagine a student working alone on an iPad with software that is supposed to help teach multiplication. Yet the student is quickly "swiping" through problems until he or she gets to the game at the end, ignoring the content. However, if the student is working with another student, they are more likely to move at a slower pace and probe each other with questions about the content and navigation. Co-use creates opportunities for students to discourse about what they are learning and doing. Since most software applications are created for individual use, it’s important for teachers to create co-use strategies. 1. Student to Teacher: When there is a classroom of students with their own devices, teachers cannot easily sit down with each student. However, teachers can set up structures to create an atmosphere of co-use. They can model how to navigate software and the type of thinking that students should be doing with an "I do, we do, you do" approach. During whole-group instruction, teachers demonstrate an "I do" by showing how to properly navigate the application. In addition, they model how to think when moving through the software. For example, they might state, "Once I click on the level, I need to decide which route I am going. The first option is nouns and the second option is verbs. Which concept is more difficult for me? That’s the one I want to choose." Next comes the "we do," where the teacher can ask students to go through an activity as a whole group. The final step is the "I do," where students can progress on their own. Teachers can create a paper checklist of "thinking" while using the software, asking students to check off thinking points as they progress. In addition, teachers can ask students to periodically pause from their devices to "pair and share" what they are learning with another student. Finally, teachers should sit down with students as they work to question them about their thinking. 3. Student to Parent: At home, parents can co-use digital devices with their children. Instead of handing a child an iPad or setting up a movie or show on a laptop, they can talk with their children as they navigate the application or watch the movie. Throughout, they can probe their thinking with questions such as, "Can you tell me what you just read in that paragraph?" 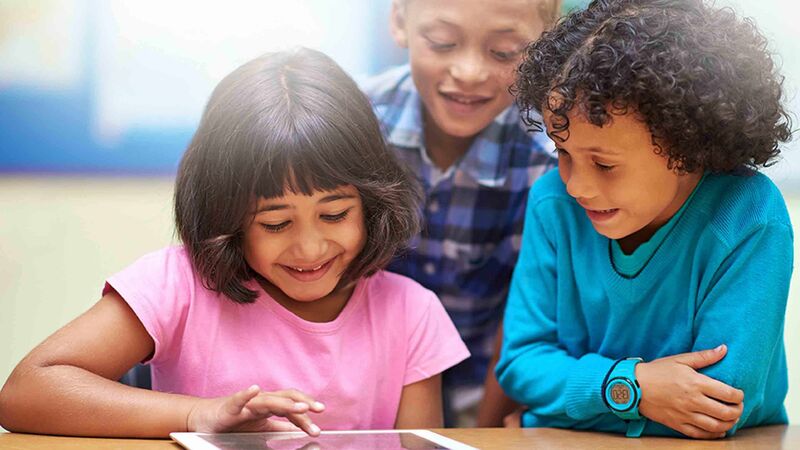 Teachers can send home a tipsheet on how to co-use technology with children. Most educational software is created for individual use. However, you can find some well-designed software created specifically for co-use. Below are examples. Literacy Learning: Kindoma developed early-literacy software that focuses on interactivity between adults and children. Communication and literacy learning happen through video with drawing, game play, and co-reading. This is wonderful to use in a P-2 classroom when pairing older and younger students! Write About created literacy-based software that can be used for a variety of subject areas and grade levels. Write About encourages collaboration through shared forms of writing, drawing, revision, and publication. The collaboration can work for student to student, teacher to student, and parent to student. Assessments: GoFormative and ClassKick are both synchronous tools that allow teachers to create assessments for students. Teachers can synchronously view student work in progress as they draw or type. They can digitally interrupt the workflow to give individual students immediate feedback, hints, or encouragement. Annotate is a synchronous tool that lets students collaborate to create animation or a live screencast to show their understanding of a concept or idea. The collaborative feature allows for both student-to-student and teacher-to-student co-engagement in the software. Language and Culture Learning: ePals is a culture and language platform that encourages collaboration and co-engagement between students in different parts of the U.S. and the world. It's a safe social learning network (SLN) where students can learn the digital skills necessary for their future. Project-Based Learning: Friendstrip allows students to direct and create their own animated films using authentic objects and pictures from their lives. It’s built on the idea of students working together to collaborate on a production. Popplet scaffolds students in easily creating mind maps and graphic organizers. It allows synchronous collaboration, thus enabling students from near and far to construct ideas together. These are a few examples of software with built-in features for collaboration, sharing, and co-engagement. Please join this conversation and share what types of apps or websites you’re using that are built on the idea of co-use or co-engagement.